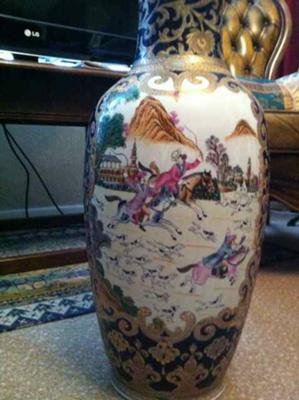 My father owns this vase, which stands around 2.5 feet tall, and I was hoping someone might be able to give me an idea of how old it is, whether it is believed to be an antique with any age, or whether it is a mass produced pattern and likely to be a reporduction. Any info at all would be very much appreciated. Actually, after viewing them the only thing in the decoration that has any resemblence to Chinese is the two mountains in the background. Even the horses, dogs, etc. do not look Chinese. But, I also have the impression that the attire/colors as well as the buildings give an impression as if they were not European. I feel some parts give a look of Persian or middle Eastern, but I am aware that is unlikely as a source of the vase. If this vase was made in China, then it cannot be very old. It could be some sort of Chinoiserie of European making, trying to give an oriental impression. I have seen some 19th century drawings and illustrations with Chinese subjects, which gave a similar impression as this central picture. They were mostly made by Europeans, but often the clothing, etc. looked more Middle Eastern than Far Eastern. But, I would not know where the spurious Qianlong mark comes in. I do know that some early Chinoiserie and European imitations did imitate every aspect of Chinese porcelain, but I do not know if they also copied the Chinese marks. If this is of European origin, then the vase could be older, however. I couldn't tell where and when this could have been made, really, due to the puzzling mixture of oriental and western elements. The pictures are too small. Larger images would be needed, showing closeups of the central image or scenery, the faces of the people, and the surrounding decoration. 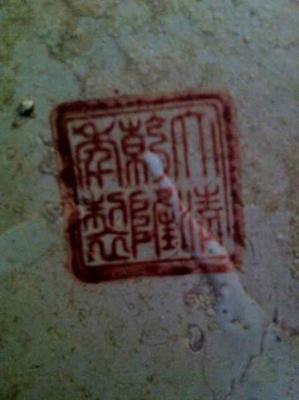 Although the mark is Chinese, it looks spurious, and the surrounding decoration looks more European or Japanese to me, even on these small images. Is this a church tower in the background? Is this a hunting scene with many dogs? This generally points to Europe, but the vase could have been made in China for export. Could you upload larger images?